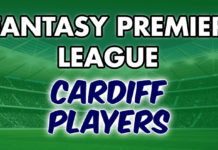 Sup and Kash continue their Fantasy Premier League journey as they attempt to climb the FPL overall rankings. Here is how my team finished in Gameweek 11. 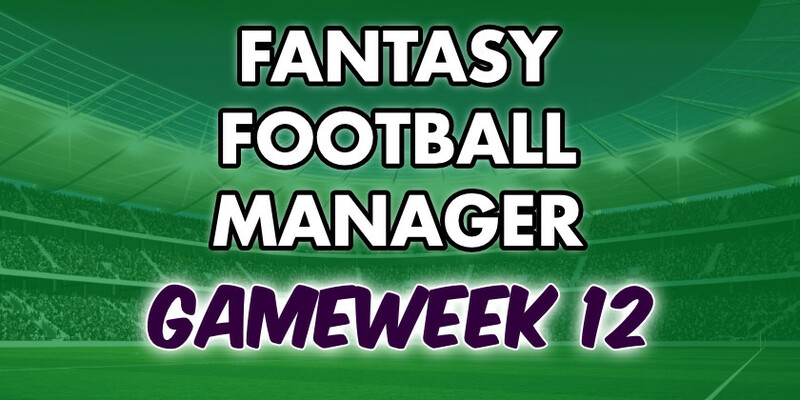 Gameweek 11 was a mixed bag for me with a decent return of 63. This resulted in a small green arrow of 6k. Marko Arnautovic returned 12 points thanks to his goal and assist and thereby justified his selection in my team. This was irrespective of a knee “disturbance”. As I mentioned in our last article, we have to be patient with Arnautovic as with these run of fixtures he will score but will be rested every now and then that could frustrate his owners. Sergio Aguero with his 26 captain points saved my otherwise lacklustre gameweek as he scored a goal and further assisted twice. Choosing him as my captain was the right decision last week, as Eden Hazard didn’t start as was rumoured. Though he played for just 30 minutes, he did return an assist, which easily could have been two if Morata completed his hat-trick when through on goal. 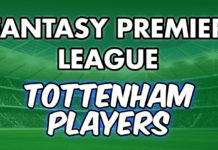 None of my defenders provided clean sheet points, however, both Kieran Trippier and Marco Alonso did provide an assist. Most frustratingly for me, Aleksandar Mitrovic scored only one point. Nonetheless, due to my captain and few pleasing assists my gameweek was decent. Downgrade Mitrovic to someone like Raul Jiminez, so I can upgrade Sadio Mane to Mo Salah. Downgrade Sergio Aguero to someone like Isaac Success, so I can upgrade Morgan Schneiderlin to Mo Salah. I feel it is essential to captain Salah against Fulham. Honestly, I am not too thrilled with my proposed options to bring him in. I don’t like the first option as that involves transferring out Sadio Mane against Fulham. Not only can he outscore Mo Salah against Fulham, but he also he gives me an edge in my mini-league where I am currently chasing someone owning Salah. In addition, this would mean I have to start Raul Jiminez against Arsenal, which is far from ideal. I ruled out the second option as there is no point in transferring out someone from Man City’s attack at the moment. Sergio Aguero didn’t play in the Champions League midweek and would therefore theoretically be fresh and starting for the Manchester derby. His current home form simply doesn’t justify transferring him out. Though Salah can outscore Aguero this gameweek, I would need Man City attack coverage after the International Break which could cost me a 4 point hit. Once I decided to risk not getting in Salah, I wanted to take care of my second concern. I want Aleksander Mitrovic out and my options to replace him are Gylfi Sigurdsson, Richarlison (injury announced), Anthony Martial in the midfield and Glenn Murray, Callum Wilson, Raul Jiminez among the forwards. As Everton, Manchester United and Wolves have all tough fixtures during the weekend my obvious choice was to bring in Callum Wilson against Newcastle. With his current form, he can score points even in this away fixture and seemed to be the best option among the replacements I had. The only concern here is the Bournemouth double up as I already own Ryan Fraser. This is not ideal before their tough run of fixtures. So my plan going forward is to upgrade Ryan Fraser during the international break to Richarlison or Martial. I will think about this more once the gameweek is over, but for now, this is my team for GW12. As can be seen, I have captained Sadio Mane over Eden Hazard this gameweek. The underlying stats of Hazard are far superior to Mane this season, so this choice is mostly a gut pick as I think Mane against Fulham will outscore Hazard against Everton. There isn’t a lot in this pick so I won’t be disheartened if it’s the wrong choice. 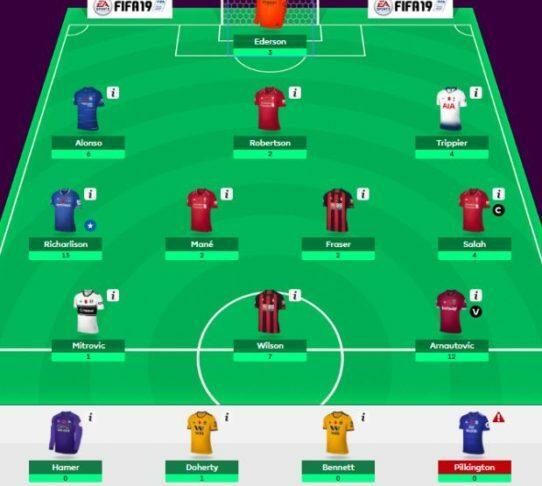 After a significant jump in GW10 thanks to a 100 point gameweek, it was time for a modest performance and a small red arrow for my team in GW11. However, I am satisfied with the 58 points my team scored in GW11 since I didn’t own the heroes of the week, Sergio Aguero and Raheem Sterling. In fact not owning anyone from Man City’s attack did hurt me as they thrashed Southampton 6-1 at the Etihad with Aguero and Sterling raking up a respective 13 and 21 points. The fact that I did own Sterling even 2 weeks back was a bit disheartening but then I need not complain as bringing in Salah for Sterling at GW10 was a well thought out plan regardless. I put the captain armband on Mo Salah despite him playing a relatively tough fixture against Arsenal at the Emirates. He was my best bet being a non-Aguero and non-Hazard owner. But then Salah blanked. I wasn’t expecting lots of points but was hoping he’d return at least more than appearance points. Arsenal was pretty solid throughout their defence and Sead Kolasinac had a strong game to restrict Salah to momentary bursts. That being said, Salah didn’t really disappoint and did come close to scoring on a few occasions. When your captain blanks, your gameweek tends to suffer. However, mine was saved mainly due to a couple of standout performances which I am going to discuss below. Bringing the Brazilian in for a hit on GW7 finally paid off after weeks of modest returns. After taking some time to adjust to his new role of the Centre Forward, Richarlison finally came up with the virtuoso performance that he was due. His brace against a resilient Brighton was a delight to watch and assured me of my decision to have trust in him and bringing him on a bit early. Everton has a few rocky fixtures thrown in between easier home games for the coming few gameweeks but this performance ensured he is not going anywhere from my team any time soon. After no-showing on GW10 owing to a reported illness, the big Austrian was back! Doing what he does best, Arnautovic scored one and set up another for Felipe Anderson as West Ham demolished a poor Burnley side. The performance ensured the maximum quota of bonus points for Arnautovic, much like Richarlison. Other regulars like Callum Wilson, Marcos Alonso and Kieran Trippier also came up with attacking returns to help my team not suffer much due to the Salah debacle. Wilson’s goal against Man Utd was especially welcome as I’m convinced that I don’t need to think about replacing him for the rocky fixtures ahead. No clean sheets for Chelsea, Tottenham and Man City were disappointing but Alonso and Trippier chipping in with assists and Ederson delivering a save point made up for them to some extent. Trippier, in particular again teased a double-digit haul but ultimately was at fault to concede a poor penalty. Trippier owners are now used to such teasers not coming to fruition now. Salah was not the only one to disappoint me as his teammate Sadio Mane too failed to register any FPL points. Frsutratingly, he should have had a goal but was wrongly ruled offside. It was a poor decision by the linesman and did deliver a hard blow to my GW11 aspirations. Ryan Fraser, my second Bournemouth asset was lively and came close to scoring and assisting both but ultimately could not convert any. However, both Mane and Fraser did shine for most of their matches and I am not really bothered with their blanks as they are vital cogs in my team and will come good sooner or later. The same cannot be said about Aleksandar Mitrovic. Perhaps in the poorest game of the season so far, Fulham failed to register even a single shot against the struggling Huddersfield side and Mitrovic was anonymous for the entire game. The Serb is a natural scorer and will probably regain his scoring form at some point of the season but at the moment, I am disappointed with the Fulham side and don’t see Mitrovic getting as many scoring opportunities as he should. 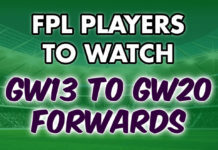 My transfer plans for GW12 are likely to circulate around Eden Hazard much like the past few gameweeks. Not owning him makes it painful to sit and watch Chelsea games. His injury was the latest reason but now that he’s fit and even started this Thursday in the Europa League, there’s no reason why he should still be missing from my team in GW12 when Chelsea take on Everton. Almost 70% of Hazard’s attacking returns this season have come at home, and some of that in reduced game time too. Moreover, Everton has been poor in their away trips and have averaged conceding nearly two goals per away game. All these indicate a Hazard move to be profitable this week. Naturally though, I have to make adjustments elsewhere to bring him in. While I have my reservations to remove Fraser before a game where the probability of attacking returns are relatively high, I am not very comfortable to see the likes of Success or Vokes get a starting role with Richarlison in the bench. Also, Hazard is not my captain choice this week as I am keen to put the armband on one of my Liverpool attackers (Salah or Mane). Chelsea’s GW13 fixtures against Tottenham at Wembley makes me rethink if this is the ideal entry point for the Belgian in my team. 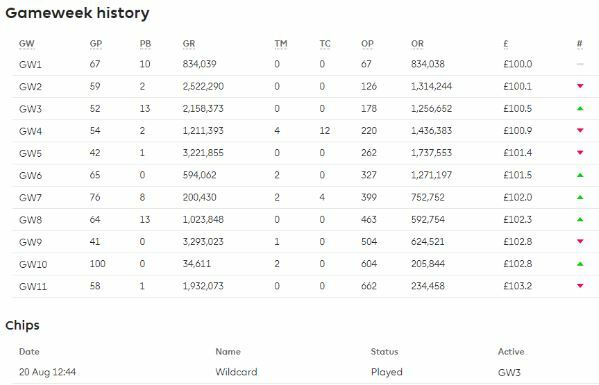 I may be holding fire for an extended period of time now but still, team balance over individuals has always been my mantra in FPL. Burnley’s defensive woes present a big shout for Jamie Vardy to fill in for a week. An alternative option, Lacazette has been more consistent and regularly score a lot of goals at home. Finally, Morata, even last month wouldn’t have featured in my watchlist but his form (3 goals in last 2) is something that has made me interested in him as a short-term option. Morata, not in form is a pain to watch and certainly not a long-term option but glimpses of the old form and a home fixture presents a fair differential shout. Lack of Manchester City attack is another worry in my team and I will fix it after the international break to follow after GW12. I am delaying the move as this week we have the unpredictable Manchester derby and its always safe to ignore a fresh pick from that fixture. Man Utd’s midweek win over the mighty Juventus in the Champions League away fixture may turn their season for good. Consequently, I don’t see them getting thrashed this weekend. 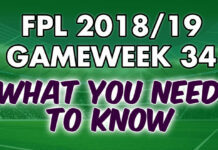 The FPL Gameweek 12 captaincy is a simple one: Salah or Mane. A week where I have no intentions to look beyond my double Liverpool assets for captaincy and a big reason why I may end up giving Hazard a miss in my team for yet another week. Fulham has been the poorest side this season in the Premier League when it comes to defending. Facing Liverpool at Anfield is only going to make things worse. Now the question is Salah or Mane for the armband? Well, honestly for these two, determining statistically is a task in itself. So I relied on eye test and fiddled with some stats including home performance. While Mane has been clinical in the finishing department, Salah has taken up both scorer and provider roles, with 5 goals and 4 assists, nearly 70% of which has come at home. Mane does not fall much behind with almost the same home percentage as 4 of his 6 goals this season has come at home. It’s the just the extra assist potential which makes me lean slightly more towards Salah than his Senegalese counterpart. 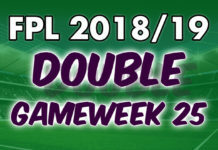 I do expect both to chip in attacking returns as this has been the fixture along with the Cardiff one for which I doubled up on Liverpool attack in the first place. It has been rewarding so far, and I hope it will continue to be so this weekend. You can follow us by clicking each of these links: Facebook, Twitter and Instagram. 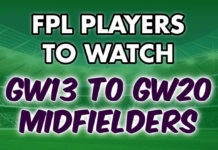 FPL Managers with combined 4 seasons experience and penning our managerial bent of mind into thought-provoking content related to FPL.